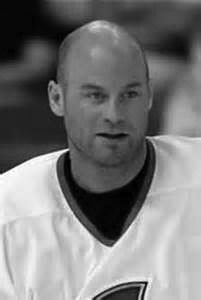 Bryan Smolinski started playing college hockey in 1989 at Michigan State University and was drafted as the 21st pick in the 1990 NHL Draft. He joined the Bruins after completing his four years at MSU where he was named All-CCHA first team and NCAA All-American. Smolinski played 17 seasons in the NHL with the Bruins, Penguins, Islanders, Kings, Senators, Blackhawks, Canucks and Canadiens. He played in 1,056 NHL games, scoring 651 points with 274 goals and 377 assists. Smolinski was a two-time member of Team USA for the World Cup (1996 and 2004) and a two-time member of the U.S. World Championship team (1998 and 1999). Growing up in Genoa, Ohio, Bryan Smolinski did not see a lot of ice, unlike lots of boys in Canada. But they played some professional hockey 15 minutes north, in Toledo. The Goaldiggers skated, there. Young Bryan liked what he saw. And so, he ran the daylights of his driveway and on the streets, lugging a hockey stick to-and-fro. Eventually he found enough ice. Smolinski’s outstanding career at Michigan State, a 21st selection in the 1990 NHL draft, a 15-year career in the big league and 18 as a professional sprang from strong family values, a Polish heritage and lots of hard work. “In the life I had, being a Polish-American, that was my family’s values,” Smolinski said. “Hey, nothing comes easy; it’s that old cliché. If you want something bad enough, you’ve got to work hard to go get it. His dad, Tom, made sure young Bryan not only got to Goaldiggers games, but he helped him find what could be a rarity in those days – ice. Tom Smolinski also got young Bryan to what rinks did exist, the Ice House, in Toledo, and the Tam-O-Shanter, in Sylvania. Eventually, father and son realized, Bryan outgrew the local hockey scene. To improve, he needed better team mates and opposition. “I wanted to play against better competition,” Bryan said. “And that’s how we came to Detroit. Early on, coaches helped transform the kid on the driveway into a big college prospect. “There was a guy that played for Toledo and he was my squirt and pee wee coach, his name was Doug Mahood,” Smolinski remembered. “He played in the IHL. He was a real strong and tough guy, and he was the one who really taught me how to love the game, how to play the game. What young Bryan wanted to do eventually was attend Michigan State, as a hockey player. Desperate to get to East Lansing as quickly as he could, Smolinski managed to skip his junior year of high school. And he fell under the sway of a hockey legend across North America, Ron Mason, the great Spartans coach. “He would go out of his way to kind of prepare you for the next stage, whatever it was,” Smolinski recalled. “I had an opportunity to become a pro, because of the high draft choice that I was. So, I had just a little more of an opportunity than somebody else. It wasn’t like I was going to have an easier career just because of that. He taught me how to work for it. The Bruins had drafted him 21st, in the first round, after his freshman year. But he stayed, and played out his eligibility under Mason. In Boston, a tough-minded hockey town with a long tradition and elevated expectations for young players, Smolinski scored 31 goals and 20 assists for 51 points in 83 games, his rookie season. “I had a great coach in Brian Sutter, and Mike Milbury was the GM,” he said. “Brian played the game very, very hard. He wasn’t very skilled, but he played with both energy and his fists, you know? He made you play bigger than you were, and I really enjoyed that. Especially in Boston, you had guys like Cam Neely, Ray Bourque, and one of my goalies was Jon Casey. These guys are big names, you know? I was playing with Joe Juneau. It was a lot of fun, a lot of fun. “I played on multiple teams throughout my career and I went to two conference finals, one in Pittsburgh in ‘95 and one in Ottawa in ‘02 and you know, I lost them both. “And that was as close as I got to the Stanley Cup finals. “So, you know, you get as close as you can, and it brushes right by you,” Smolinski said. “I wouldn’t call it a disappointment. Obviously the goal of every hockey player is to win the Stanley Cup. Some guys can win multiple, for whatever reason. And you just can’t put a finger on it. “I was always on teams that were up and coming, teams that were building. You build to a point, you build to a point and you get traded and go back to a team like that or try to help a good team. “I had a niche in the league, but I never found a veteran team, like Detroit, that had the swagger, the make-up of a Stanley Cup winner. We were always in the middle of the pack. “And you know there’s something to be said: I played a lot of years and I was okay with that. Smolinski lives in Bloomfield, where he is raising four children and remains active in minor hockey.